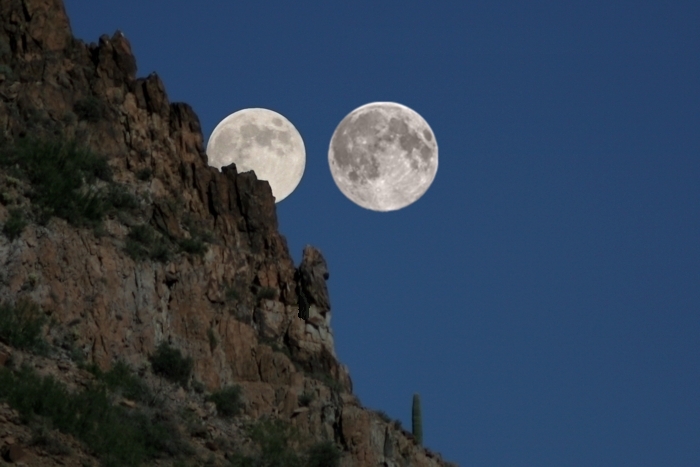 There was a Super Moon last month on November 14, and the month before on October 16. The November 14 Super Moon was the largest seen since 1948 and won’t be that large again until 2034. It was 14% larger than an “average” Moon and 30% brighter. The difference is noticeable to the unaided eye, especially when the two Moons are compared side-by-side as in the above image. I won’t say much about what a Super Moon is, since I covered that in my May 21, 2012 post. You might want to check that out before proceeding — it includes two animations showing why the Moon changes size and how that change appears to the eye. Then come back here for the rest of the story. 1. The Moon’s elliptical orbit brings it closest to Earth every 27.32 days. 2. A Full Moon occurs every 29.53 days when the Sun, Earth, and Moon are arranged in a straight line. 3. The Moon’s elliptical orbit itself rotates around its orbital plane (apsidal precession) once every 8.85 years. It’s the interplay of these cycles that creates Super Moons. By definition, a Super Moon is a Full Moon that happens within ± 10% of the distance of closest approach (a point called perigee). This is, of course, an arbitrary definition, but it’s what astrologer Richard Nolle decided on when he coined the term Super Moon (sometimes “Supermoon”) back in 1979. It is not an “official” astronomy term, but astronomers and the media have picked up on it. So when things are lined up like they are now, we can get three Super Moons in a row because of the near-perfect alignment of the Nov 14 Super Moon — it’s that ± 10% that allows the preceding and succeeding Full Moons to also qualify. On average, about one Full Moon in 14 will be Super. But near-perfect alignments like Nov 14 are more rare, occurring at intervals of 20 or more years. The 30% increase in brightness is easily explained by the inverse-square law of light propagation. The brightness (B) of a source of light decreases as the inverse-square of its distance (d). That is: B1/B2 = (d2/d1)2. So if the Moon is 14% closer (as it is at perigee) it’s light will be (1.14)2 = 1.29 ⇒ 29% brighter. We get a bit more brightness on this series of Super Moons because they are occurring near Earth’s perihelion. Earth is closest to the Sun around January 3, and that increases the brightness of the Sun. The Sun is what illuminates the Moon. But this is a smaller effect, accounting for only a ± 3.5% brightness variation.